The only all Australian Made workboots left in Australia. Rossi pride themselves on their quality workmanship and product toughness. Full grain claret kip leather upper with double stitched elastic side panels offering strength and support. Self-fit footbed that moulds to your individual foot profile. Anti-tear all leather rear pull tab. The sole is made with air cushioned dual density rubber polyurethane composition, Incorporating Rossi air inside technology. 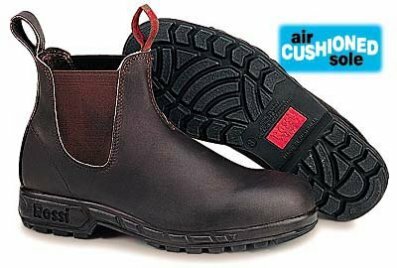 All Rossi Boots are manufactured in Australia under the guidance of Quality Management Systems AS/NZS ISO 9001:2000.